Incoming!! 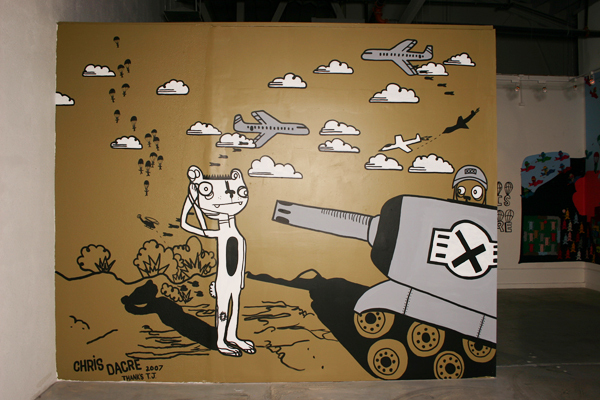 Chris Dacre: WAR is FUN! 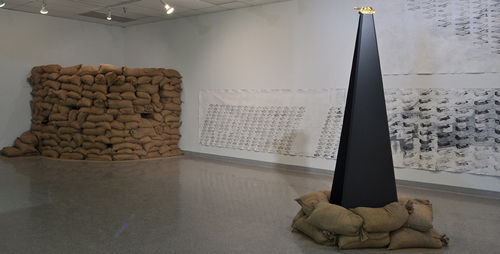 Chris Dacre (rhymes with baker) is the winner of the 2011 Sharadin Gallery Installation Residency at Kutztown University. The residency, which comes with a $10,000 budget, attracted over 150 proposals from all corners of the world. I visited Dacre’s website to learn about his artwork. Most recently living in New Mexico, he has a BFA in Graphic Design and MFA in Printmaking. 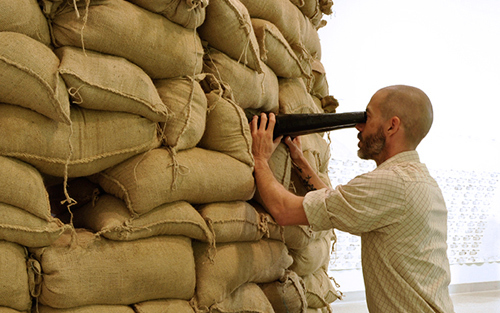 An Air Force veteran, his recent work is about how we think about (or avoid thinking about) war. His upcoming Kutztown project is called “War is Fun.” I emailed him a few questions. “Hmmm. I believe Drive By Press, that Joseph Velazquez started, has brought more awareness to the medium by taking it across the country and introducing a wide variety of students to some really cool artwork. I think that was an important breath of fresh air that this medium has been waiting for… In the past -in my opinion- a majority of printmakers were making really serious, dark imagery and, of course there is still a lot of that around but Drive By Press has shown that it can be quite a fun medium without all the stuffiness that used to be associated with it. Any particular artists you found influential? I thought of Red Groom’s Ruckus Manhattan looking at your installation images. Any advice for young, college age, artists? “I guess the best advice I can give- well maybe two bits of advice- the first being something that DZINE told me was that you need to learn about the history of artists by reading their biographies, looking at contemporary art publications and by watching movies/shows like ART21. At first when he told me this I was like “yeah, yeah, whatever” but then I realized he was right. 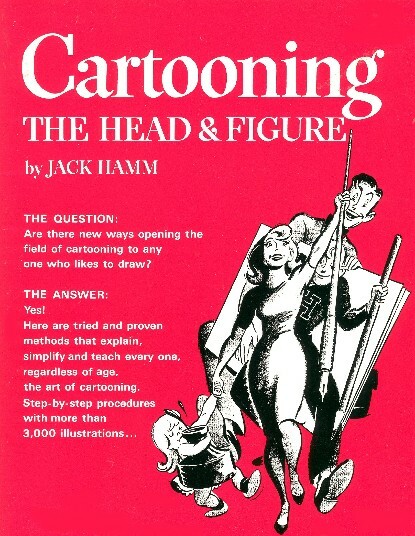 Look at other artists and learn from them- when you get out in the art world these people will be your competition. 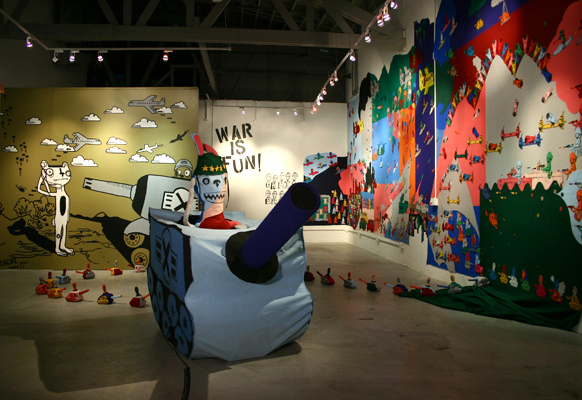 Chris Dacre is looking for a few student volunteers to help him install “War is Fun.” If you have some time, roughly between Jan. 12 and 18, contact Gallery Director Karen Stanford, stanford@kutztown.edu, or drop by the gallery and meet the artist. UPDATE: 2/21/11 : The Reading Eagle wrote a thoughtful review of the exhibition here. Next > Who lives in a Pineapple under the Sea? –Who draws him?